Now, if you’ve never had soondubu jjigae before, you seriously haven’t lived. This flaming stew packed with silky creamy tofu, beef and seafood — usually served bubbling-hot in a thick earthenware bowl — is unforgettable. There is the intensity of the Korean hot peppers, yes — but beyond that there are layers of complex flavors sparring with each other: the earthy richness of beef, the briny umami of seafood, the crisp punctuation marks that tiny bits of green onions will offer. As much as I love ordering it, I’d never thought of making it. After looking at several recipes a while back, I started to feel that this wasn’t a dish I could wing in good conscience. If you’re going to make it, you need to invest time in making a hearty kelp-anchovy stock from scratch or else, what’s the point? And then a recent jaunt to my go-to Koreatown grocer started me thinking. Browsing the miso aisle, I came across a tub I’d not noticed before. 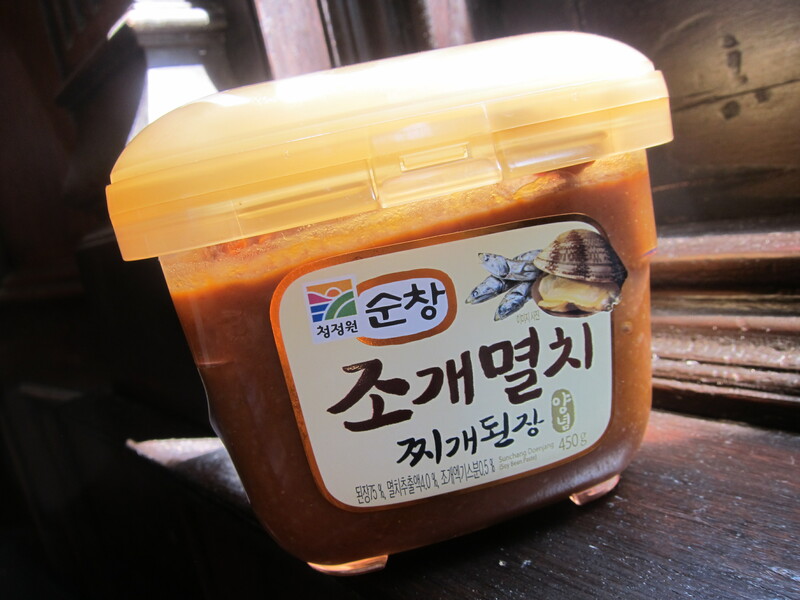 Now, I can’t read Korean, but a look at the list of ingredients (and the helpful picture on the front) led me to believe that this was a tub of anchovy- and shellfish-inflected miso. Could this offer a solution to my anchovy-kelp broth sloth? I had to find out. 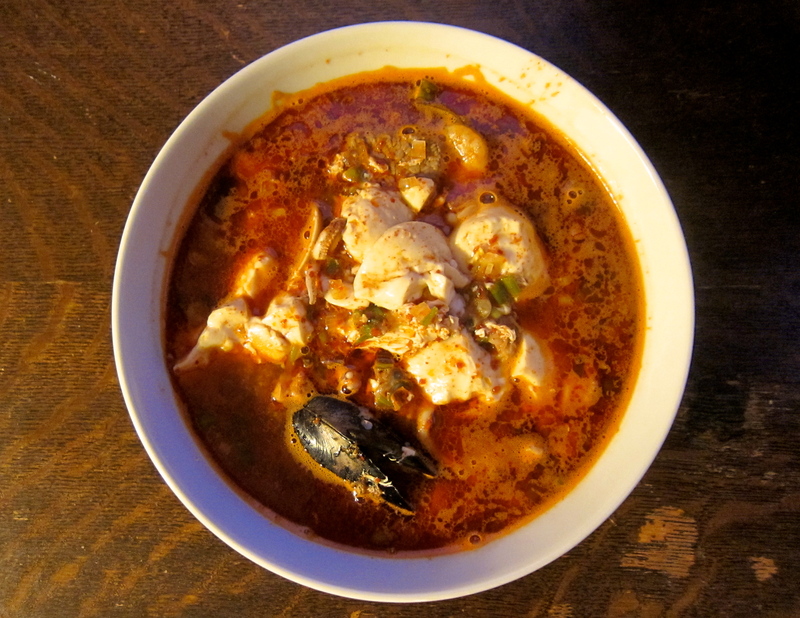 First things first — I consulted my favorite Korean food blog: Maangchi. 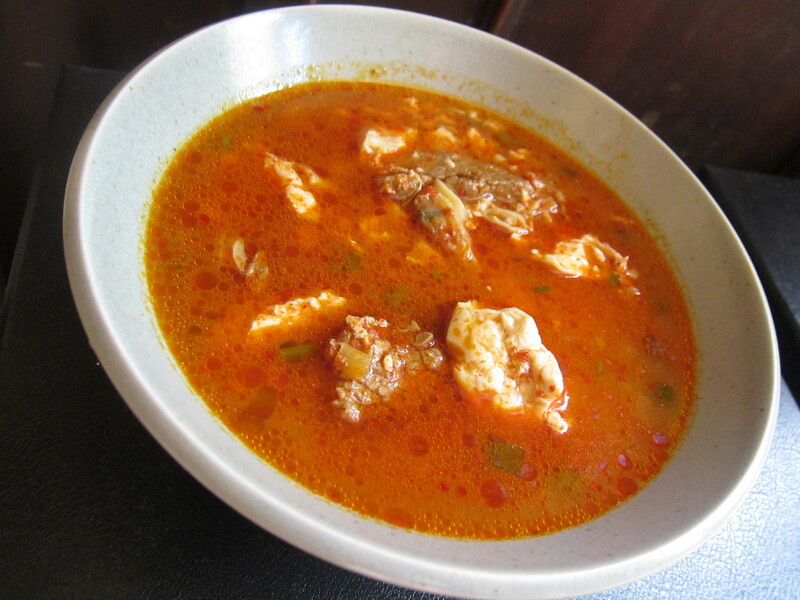 Maangchi’s soondubu jjigae looked stunning, and the recipe (sans broth) looked easy enough. … along with the silken tofu and chopped scallions. Once that came to a boil, I cracked two eggs into it, gave it a stir, drizzled some sesame oil on the top and we were ready to eat. The best thing was, this stew came together in under 20 minutes. And since I’m trying to be better about writing recipes down, I even have the step-by-step for you to give it a whirl below. 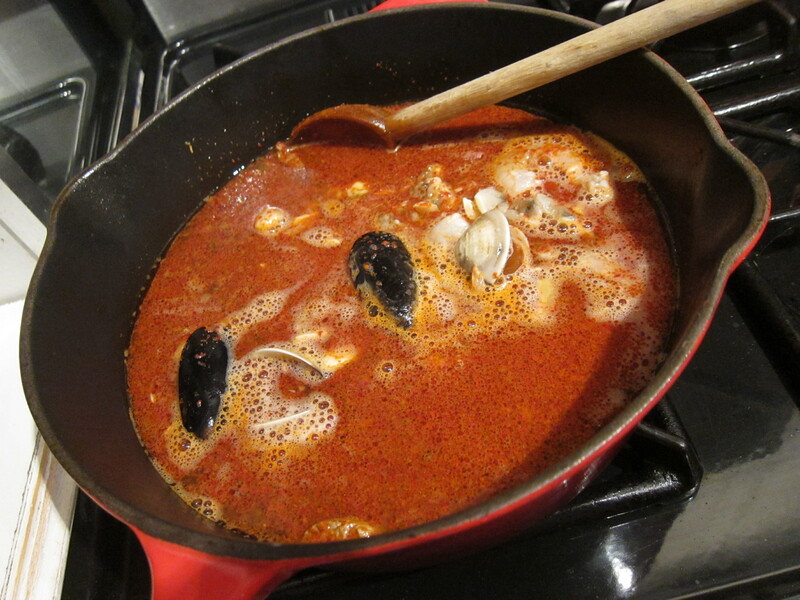 Add gochugaru — note: Maangchi’s recipe suggests two to five TB of the stuff, two being mild and five being “suicidal hot!” Stir-fry that a little to mix everything up, then add seafood stock, anchovy-miso paste and fish sauce. 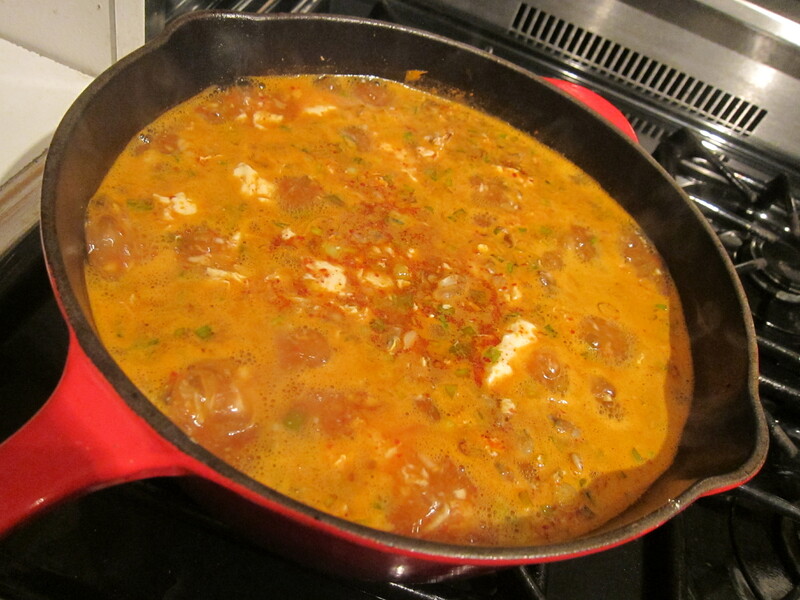 Mix well, add seafood, then slice each tube of tofu in half and let the tofu slide out into the pan. Very gently break that up so the tofu remains in large chunks. Bring mixture to a boil then add scallions and crack two eggs in, mixing gently. 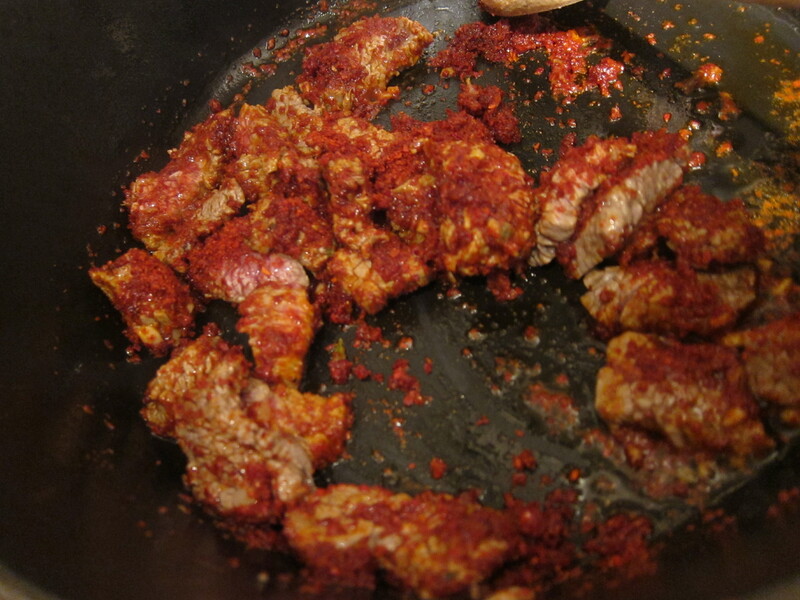 Once that comes to a simmer, drizzle sesame oil all over and serve immediately with rice.